This "Boston Tunnel" truck, as it's history was described to me, and some associated parts are out of our area of focus. They landed in our possession as part of a move of parts in the Charlotte area from a railroad tenet that was asked to remove their possessions from a local warehouse (It's always good to pay one's rent). We have no use for the truck, compressor, etc., so it's free to anyone who would like it. Clearly, any interested party will be responsible or removing the truck, but most of the dirty work for retrieving it has already been completed. The truck now sits next to a 20-foot door in a large warehouse ready to be picked, strapped and hauled away. Feel free to message or call me if you are interested in these parts. I'll send pics since the files are too large to post here. I've lived in New England for all 48 years of my life and have a pretty good knowledge of Boston, its railroad (and rapid transit operations) and history. I have no idea what a "Boston Tunnel" truck is, or if it has anything to do with the city who's Sox are going to the World Series in 2018. I think he's referring to a Taylor truck from the Boston tunnel motors with the motors rewound for lower voltage (250?) DC. Lots of them have been traded over the past couple decades. 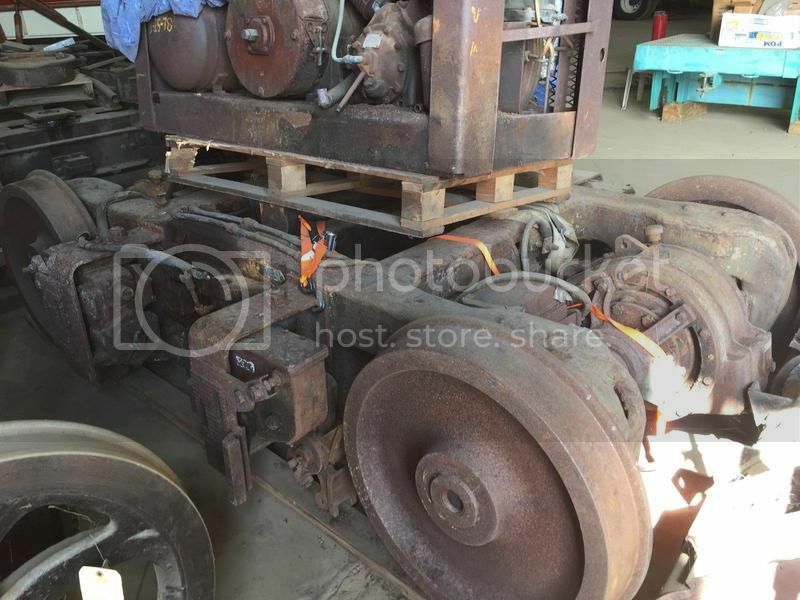 I've heard they can be used as the basis for making a new single truck Birney truck by stripping it and fabricating a new frame to remount the parts in. You might be able to convert it to 24" gauge but it seems like a very difficult proposition compared to just cutting it apart and reusing bits and pieces. here is a photo OP sent me. Nope, not a Taylor tunnel motor truck - looks PCC to me. Definitely a Red, Blue or Orange line truck from the 1950's to 1980's. Note the third rail shoe brackets. Rapid transit car truck from 1960s. Most definitely NOT PCC.